The process of becoming a parent teaches lessons you never expected to learn. There are, of course, many small nuggets of wisdom that lodge in your brain; the prevailing signs of a wet diaper (thanks to modern technology, diaper wetness can be scientifically verified), and your child’s entertainment preferences (or, how to overcome your fear of acting foolish in public). The bigger challenge is learning to live with the responsibility of guiding your precious child. As the father of a 6-month-old, I’m slowly learning to be comfortable amid the chaos (and sometimes, I still feel productive). Being a parent is draining, tough work: on par with your most difficult professional challenge (if it was also your reality, every hour of every day). Even though it’s wild and wonderful too, I’m also glad for a partner to help share the load. But there is one area where, no matter how progressive gender roles may be, it is nearly impossible to function as equals. 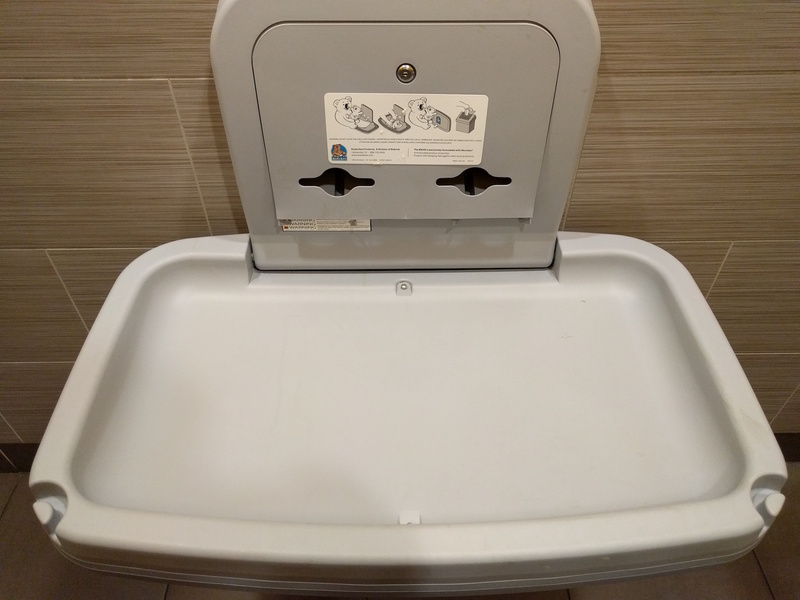 We need to have a frank conversation about changing tables in public restrooms. While the ladies’ room frequently has a reliable, fold-down, waist-height station where you can lay down and strap in your child, the mens’ side usually has no such amenity. The photo above, taken at a local quick service restaurant, is what I consider to be the minimum standard of convenience for any restroom, public or otherwise. Even this isn’t the finest example (as it’s missing the belt), but perhaps a diligent father could still use the table safely. Often, I send my daughter away with my wife or change her diaper in the stroller. It isn’t pleasant for either of us. To curb that frustration, we prefer establishments that provide well-maintained restrooms including changing tables. This is a requirement to earn my business; because while our family often dines together, the day is coming when Sloan will join me for an errand sans my wife. I won’t have her assistance then. This conversation is broken record. Many large corporations know the request well, but smaller operations should hear the message too. We, Dads of the world, demand a place to care for our children while in your place of business. If your facilities are dirty or in a state of disrepair, we will go elsewhere.